Biriyani, this one pot meal is our family favourite and i never forget to dish out this flavourful dish once a week especially for Sunday lunch. Though my kids are ardent fan of non vegetarian biriyanis for their lunch, they wont says 'no' if i serves vegetables loaded biriyani. 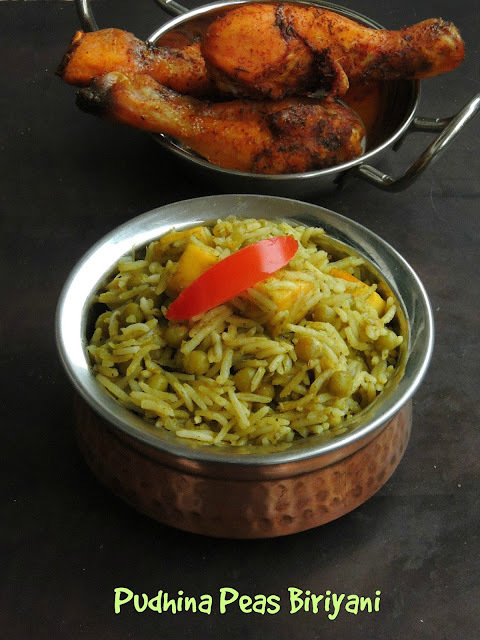 Obviously our love for biriyani pulls me to dish out varieties of biriyanis and i have few more to post in my blog. However its not too late to post one of my most favourite biriyani aka Green peas biriyani with paneer cubes. Am posting this fantastic and aroma filled peas biriyani for my today's post as am running Mega marathon for whole month. And i will be showcasing 5 ingredients for 5 weeks. For this first week of this mega marathon, am posting dishes which i dished out with dry green peas. After a baked dry green peas kebab, i couldnt resist to post this aromatic mint flavoured green peas and paneer biriyani for my today's post. This dish calls for usual spices we go for biriyani apart from spiced mint paste which is a must for flavouring this rice dish. Usually Biriyani calls for chopped mint leaves for flavoring, just imagine if rice is cooked with a mint-spice paste how flavourful this biriyani will be. Very easy to make, this biriyani makes an excellent meal if served with boiled eggs or else with fried chickens. However vegetarian will definitely enjoy this fabulous biriyani with onion raita. 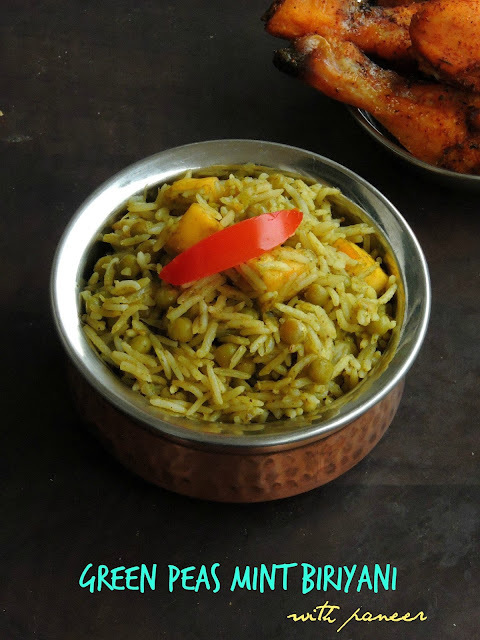 If you love green peas or paneer and biriyani, then this one pot meal is definitely a treat for you. Grind all the ingredients under 'to grind' as fine paste, keep aside. Add immediately the sliced onions and sauté with salt until the onions turns transculent. Now add the grounded paste, ginger-garlic paste and saute until the raw smell goes away. Meanwhile wash the rice and soak the rice with yogurt and water,keep aside for 15minutes..
Add the garam masala, soaked green peas,cubed paneer to the cooking veggies, cook for few minutes. Drain the soaked rice and add the rice soaked yogurt-water to the cooker,bring everything to boil. Cook upto three whistles,put off the stove. Once the steam gets released, give a stir gently. Serve hot with onion raita or else with a spicy side dish. Green peas and paneer pulao sounds inviting and tempting..I am eyeing on the chicken in the backdrop.. Even we love biryani and it is mostly job veg biryani. Peas and paneer biryani looks flavorful and mouthwatering. And I am also drooling over those chicken drumsticks in the background. That is an interesting Biryani with paneer and peas. Loved the light green color mint gives the rice. Great pick! I add mint paste in all my pulao recipes. 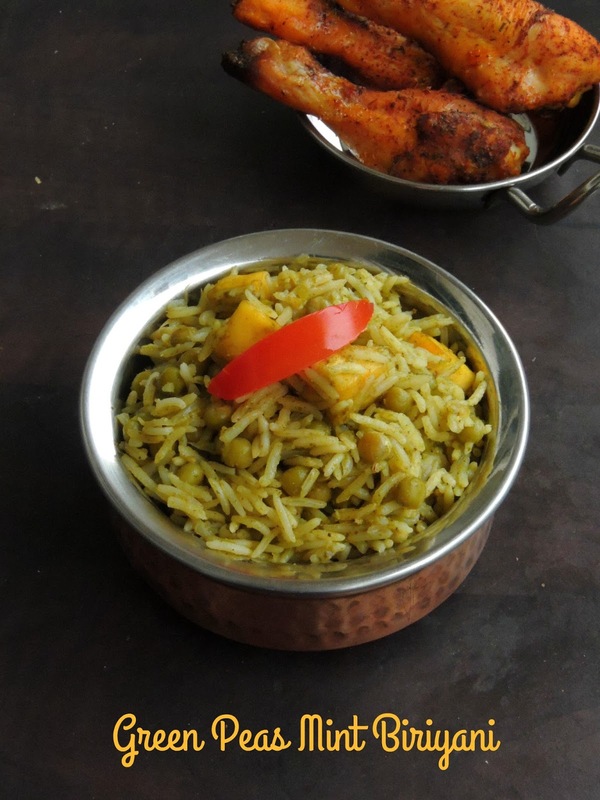 This green peas pulao looks so flavourful and delicious..
That one pot surely looks amazing Priya..the texture of the rice looks so inviting as well.. I always love biryanis and pulaos.This peas and paneer combinations sounds delicious in biryani. Such a flavorful Biryani, Priya. Would love to have it. I am a great fan of one pot meals and this one is packed with flavors and nutrition. One more great recipe with dried green peas. That is one great one pot meal idea. It is loaded with nurtition besides being delicious. MMm this will go down well with my girls. Thanks for the recipe. Delicious combo and with a simple raita, this is a yumm feast! Such a tasteful and flavorsome biryani with mint, paneer and peas. What a flavorful and protein packed biryani that is Priya. Looks yummy!! Love this flavorsome biryani. Have to try it now!